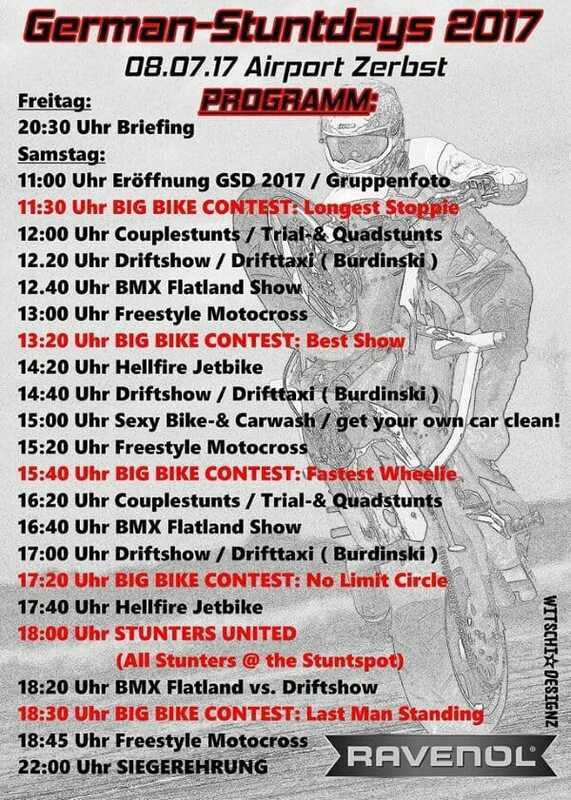 The German Stuntdays an event of stuntriders for freestyle bikers and stuntriders, but also for all others with petrol in the blood, which have fun at wheelies and stoppies. The motorcycle meeting takes place at the former military airfield Zerbst / Anhalt. Space is enough. But it is also needed when up to 30 drivers simultaneously show their skills on the locked area. 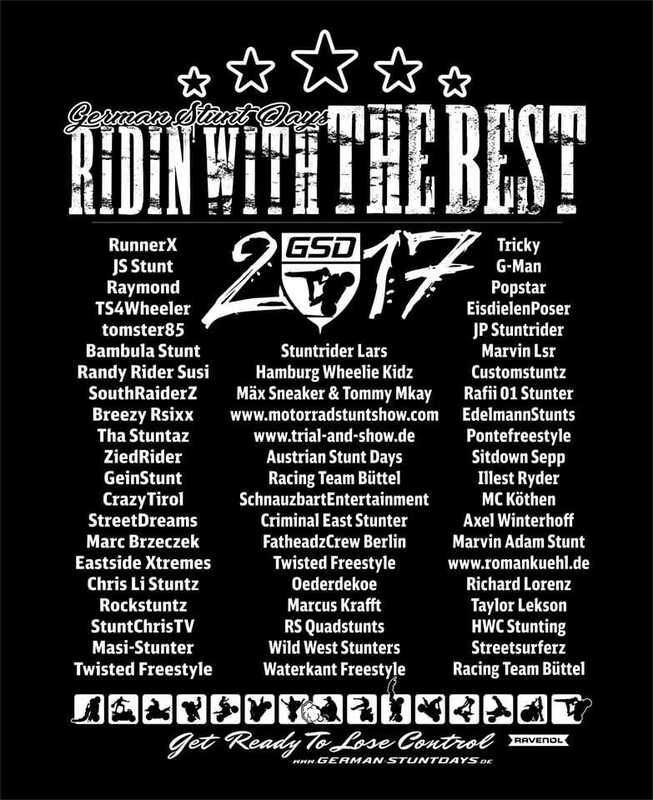 Over 100 motorcycle stunt drivers from Germany and Europe will be there to measure themselves in different disciplines. A discipline would be “Ravenol’s Fastest Wheelie”, for example. Here, two participants compete against each other in KO-System. 50m on the rear wheel to a ton and 50m back. The faster comes on. Longest Stoppie is almost self-explanatory. 30m is available to speed up. Then the rear wheel must be in the air. Whoever rolls furthest wins. A highlight should be Best Show. Each driver or team has 5 minutes to deliver their own show. This is where the complete skill is retrieved. 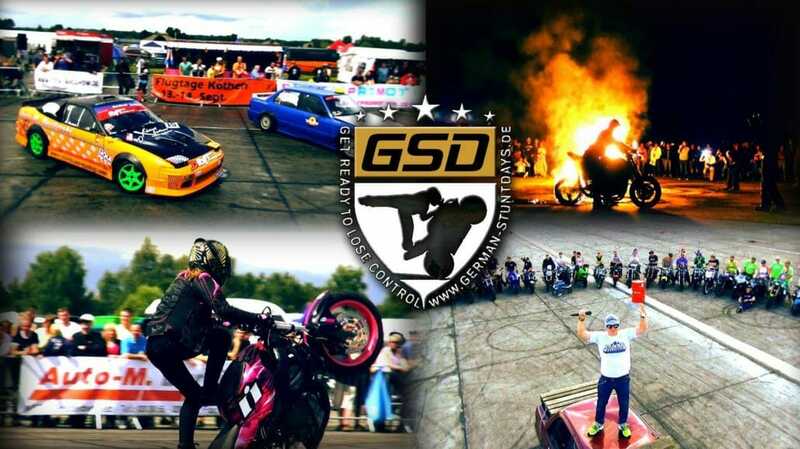 Drift cars, quads, go-karts, BMW, FMX and more are also available for variety. For 10 € entrance you can watch on Saturday the 08.07. From 6-12 years the entrance costs 5 €. Under six years it is free. This year, for the first time, a grandstand will provide a good view. I will be there too, but not to drive, just to report about it.